Today, first thing in the morning, we transfered Marks footage of his friend finishing the harpoon, it looks so cool! Mark, then, had to head to french class again with other students Amy, Ned, Adamie from 9-4 - although today it started late at 10am. Adamie wished he could start work on his project but we had an appointment to be at the school for recess and lunch today - invited by Ingrid who runs Youth Fusion . Arsaniq School is the biggest building in the community. Arsaniq means Northern Lights. Alex P so kindly drops us at the school at 9:15 with the suitcase and we set up films to view as well as the Kaleidoscope community animation project...at recess we meet Mathew and Lizzie and Annie. A few more frames of the kaleidoscope is made! In between recess and lunch we run to the the Nunavik Parks office to visit Mary, but she is not there, we quickly check out the beautiful museum! Some students are already there getting a tour so we enjoy the exhibits that we can without interrupting. Then it is time to grab lunch and head back to the school. Ingrid brings lunch for the students and we meet Alaku, Eema and Jennifer. We show some films and they experiment with the Kaleidoscope animation and we all chat, getting to know their interests. Then Alaku shows us a VERY cool film he called ‘Magic Ben’. It is funny while at the same time addressing the serious topic of bullying and incorporates magic and special blue screen effects!! They worked on it for 2 weeks as a group as part of Youth Fusion! We learn that Jennifer and Alaku are on the volley ball teams and training for tournaments ! We also learn that they work for Youth Fusion during the circus workshops! Jennifer is considering making a film about volleyball and plans to borrow a camera at 6:30 tonight! Thanks all for the fun morning! Now we head back to the residence to continue working with Arctic Guides. We set up in the living room again and then once french class is done it become a hub of creative energy and action! Ned grabs more footage from his facebook - the polar bear footage is able to download today! YAY! As well, Ned fine tunes his script. Amy jumps right in to write her script, changing her mind about her topic wanting to explore a more personal story. Mark prepares to record his song and takes a look at his footage. Adamie finishes his script and finds imagery. Grabbing images from facebook or google cloud has been SUCH a challenge. Adamie is so patient as we keep trying to grab images with high enough resolution. Once Ned finishes his script he records his audio! Then he edits it onto his time line, quickly learning the Final Cut editing program! Adamie also records his script and edits it onto his timeline! Then it is Amy's turn to record her audio voice over. We record in the quietest room in the residence down at the end, the room with exercise gear. Adamie records in his room. Then it is Mark’s turn and Amy helps out with his shoot since he wants to have video and audio of himself playing a song. He sings in Inuktitut and plays guitar. He has been playing guitar since he was 9 years old! 55 years!!! The lyrics of the song are original and detail a seal hunt….from the weather of the day and the overall experience, it reminds Mark of when he was young and went hunting with his father. Mark is able to play and sing the song in one take - PERFECT! Then the sound is synced and he can start using that as the spine of his movie. Amy then records herself in video and audio of her throat singing. She sings a song that is meant to calm a little dog. She has been throat singing since she was a little girl. There is A LOT of laughter today, and everyone works hard ! We close down the workshop at around 10:30PM! Job well done everyone -see you in the morning. 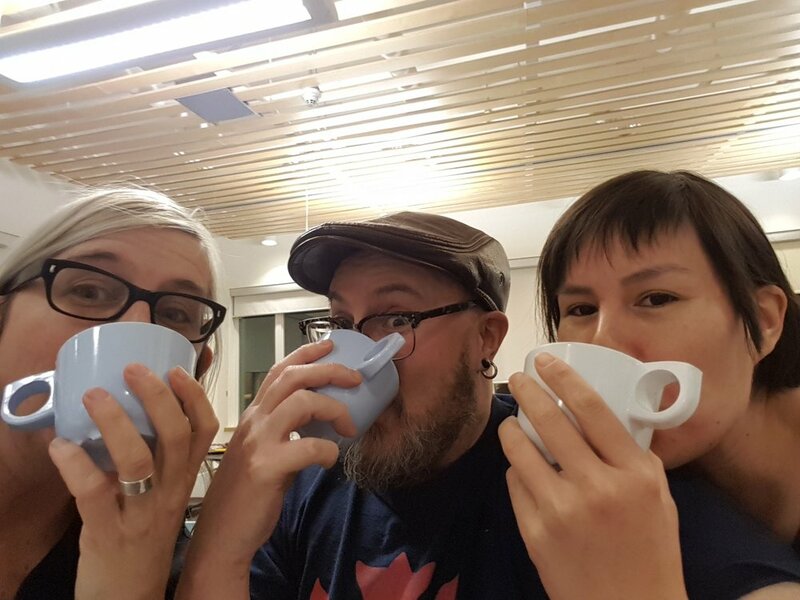 * Also of note Glenn, Courtney and Lisa get to have a little taste of the Pingualuit crater water, brought back by the Arctic Guides from the National Park, it is a real privilege to be able to do this. Thank you.